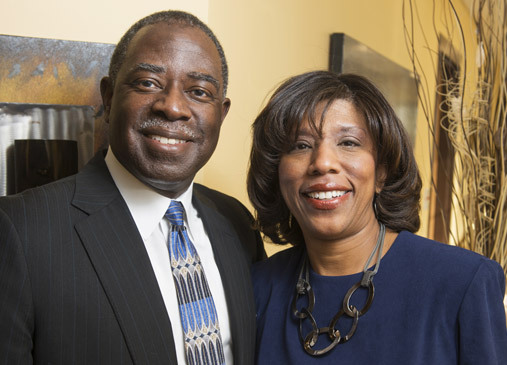 Connie and Kevin Johnson are so proud to be graduates of the Cleveland public schools that they chose to name their donor-advised fund at the Cleveland Foundation after their high schools. Their Glenwood Fund, established in 2009, is a combination of Kevin’s alma mater, Glenville High School, and Connie’s, Collinwood High School. And the couple is directing the fund to benefit education. Thirty-something years after they graduated, Kevin and Connie are successful entrepreneurs with a strong desire to give back to the community. As Connie points out, you can give of your time, talents, or treasures. And, as they talk enthusiastically about their careers and their philanthropy, it is evident that they give generously of all three. He and Connie both trace their awareness of the foundation back to the 1980s when Steven Minter was at the helm. When they “dug deeper” into what the foundation offers, they were impressed with its expertise to “take what you want to do and translate how to do it,” says Kevin, whether that is helping to qualify recipients or investing money for growth. In April 2012, Kevin worked with the foundation to set up a scholarship fund to honor his brother who died in 2008. The Lamont S. Johnson scholarship will be awarded to an undergraduate student majoring in speech pathology at Cleveland State University. “He was such an inspiration and helped so many people,” says Kevin, who credits his brother with sparking his desire to volunteer in organizations such as Big Brothers Big Sisters and Habitat for Humanity. The Johnsons’ careers are dedicated to serving the elderly. Their Visiting Angels business, part of a national franchise, helps older adults live as independently as possible in their own homes. Kevin is chairman of Fairhill Partners, a 9.5-acre campus that houses more than 35 businesses, many of which support seniors, including Visiting Angels. Connie is co-chair of the foundation’s African American Philanthropy Committee, and she and Kevin are both instrumental in its biannual summit to increase awareness within the African American community about charitable giving.